However, would this statement, and image, not be stating that the antigens found on the surface of our blood cells are foreign? Which would imply that our antibodies attack our own blood which is not what occurs? Or are the substances found on the surface of blood cells (A or/and B antigens, no antigens) only recognised as antigens when they correspond with the antibodies in the body? In other words, if I am blood type A, the pink molecules on the surface of my blood are not referred to as antigens as they are not foreign, but the green molecules on the surface of group B blood are referred to as antigens as they are foreign? With this definition, which is actually how antigens are thought of, a particular antigen need not be antigenic in every organism to which it is presented. Those organisms or individuals for which the antigen appears as ‘self’ will not recognize it as foreign as they are ‘tolerant’ to it (e.g. by mechanisms which eliminate the cells capable of producing antibodies against the self antigen). But it is still referred to as an antigen. So your understanding of the situation is correct, but that of the use of the terminology is not. 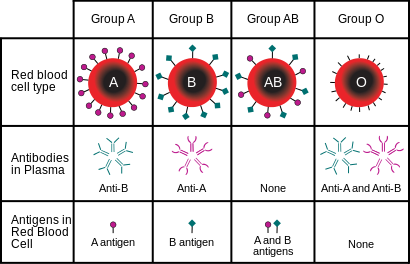 Even if you belong to blood group A and therefore will not mount an immune response to the pink blobs in the picture when transfused with blood of group A, they are still referred to as antigens as they stimulate an immune response when transfused into a person of blood group B. If you wished to talk about the fact that the A antigen on blood of type A does not provoke an immune response when transfused to persons with blood group A you could say “The A antigen on red cells is not immunogenic (or even antigenic) when transfused into persons of blood group A”. Scientific terminology allows us to describe things precisely. As our understanding increases, the terminology may need to evolve to allow us to make distinctions of which we were previously unaware. The word ‘antigen’ was coined in the late 19th century, before anything was known of the structure of antibodies, and was defined in terms of the immune response as that was what was observed. The definition evolved in some quarters to include the idea of binding to an antibody or T-cell (see e.g. Merriam-Webster definition). Not the answer you're looking for? Browse other questions tagged hematology antibody red-blood-cell blood-group or ask your own question. What is the genetic basis of blood type (ABO) system? Why is the administration of exogenous Anti-D not harmful to the foetus?